The MasterJet™ gluing station has been designed for flexo folder-gluers, and guarantees the most precise and reliable glue application. Our non-contact application method easily handles warped board - ensuring no skewing, smearing or wiping. 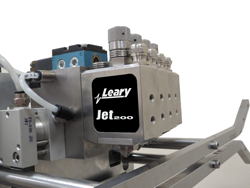 The independently controlled glue valves together with Leary's Monet™ operating system allow for spotted or dashed glue patterns, decreasing glue usage without compromising the bond. This system can be upgraded to include glue inspection using our unique, automatic glue correction technology. MasterJet™ is the only gluing station on the market which uses an auto-flush system to clean valves automatically when the machine stops, eliminating costly downtime while extending the life of the glue valves. First box run is sellable! Leary products and services are available to the global packaging market. Please see our Contact Us page for locations and how to get in touch.